When it comes to Sunday brunch in Vancouver, the Pan Pacific (held at Cafe Pacifica) is the most elaborate and expensive hands down. However, other than the view and a few unique items, I don't consider it a good value. At $50.00 per person, it's downright crazy in my books. Thus, it's always good to look at other options. One of these options is Griffin's at the Hotel Vancouver. The last time I had the brunch, it was pretty decent in my books, especially for $39.00. Yes, that is not chump change; yet considering the location and what you get, it's good. Today, we celebrated a belated Mother's Day at Griffin's. One good thing about these Sunday brunch setups is that kiddies are welcome and there is no charge for those under 6 years of age. This is particularly good since my son won't eat anything but the cheapest of items such as the waffles and sausages. I wonder if he has any Chinese in him really... It's all about the seafood and meat for me! So the food is separated into 4 sections for the buffet brunch. 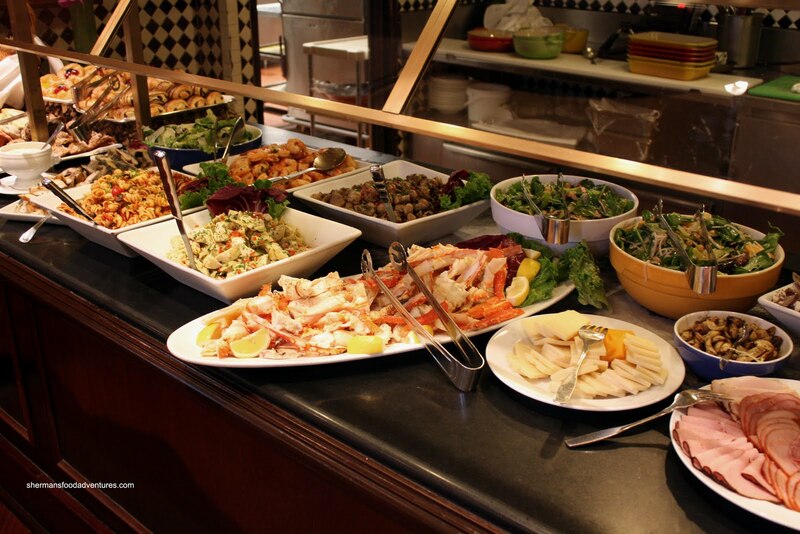 The Cold Food Station consists of breads, smoked herring, artichokes, mushrooms, bean salad, mix ed greens, pasta salad, king crab, shrimp and scallops, cheeses and cold cuts. Personally, I'm only interested in a few things in this section, namely the crab, shrimp and scallops. I'm happy to report that all 3 were good, especially the large meaty scallops. 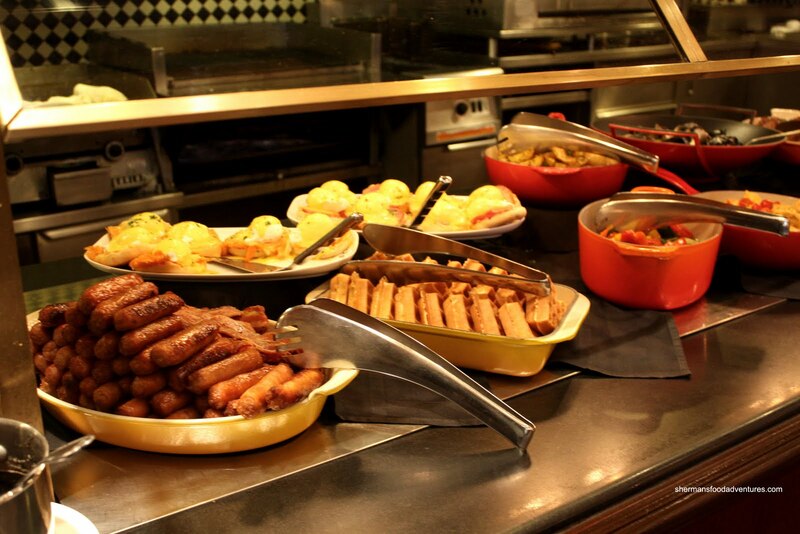 The Hot Food Station consists of some standard breakfast items mixed in with some unique offerings. Of course the sausages, bacon, waffles and eggs benny are present (salmon benny too). Despite being served on a buffet line, the eggs benny was fantastic with a perfectly poached free range egg (runny yolk). 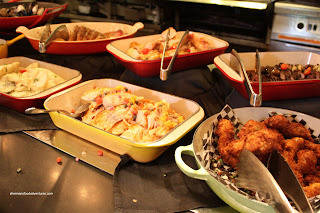 The rest of the spread included veggie mix, 7-grain rice, pasta, roast potatoes, chicken, roast pork loin, herb roast leg of lamb, spring salmon, halibut, clam & mussels saute, chirizo & merguez sausage, crispy oysters and seafood chowder. Predictably, the fish were overcooked. I'm sure they were not prepared as such; but it's very hard to serve fish properly in this manner. As for the pork loin and lamb, both were a tad dry. However, I really enjoyed the mussels and clams (I'm all about the seafood!). As for the seafood chowder, it was more like fish soup than anything. It did taste quite good exhibiting natural sweetness of the sea. 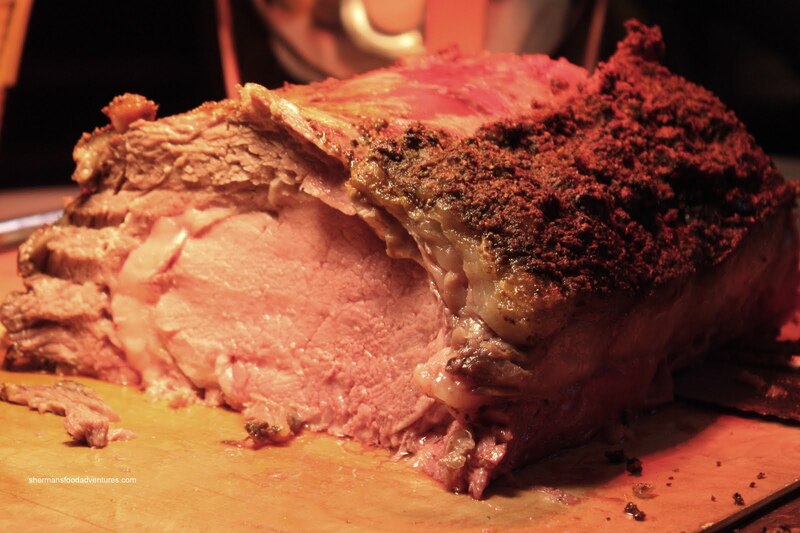 Related to the hot food section; but in a station attached to the omelet bar is the Prime Rib. Under these circumstances, it is forgivable that the meat is not more rare. After all, there are some people who would not even touch it if it were dripping with bloody juices. For me, I like it medium-rare and the best they could do was medium. Despite this, the prime rib was absolutely fabulous. It practically melted in my mouth and didn't need much chewing. This, my friends was a beautiful piece of meat. 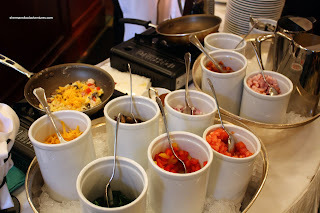 As mentioned, the Omelet Bar resides right next to the carving station. I actually didn't try an omelet since I deem it as a filler and there wasn't anything special with the selection of ingredients. My dad did have one and it was made properly looking just cooked. The Dessert Station is somewhat of a signature feature at Griffin's. 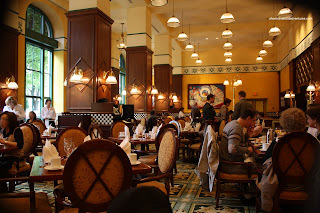 It is offered during regular dinner hours as a dessert option. For a buffet, the desserts did look quite appealing. The spread included fruit flan, cheesecake, chocolate torte, rice pudding, creme caramel, white and dark chocolate mousse, profiteroles, fruit tart, berry calfoutis, apple pie, English trifle and fresh fruit. I tried to sample as many items as possible and on the whole, everything was quite good. 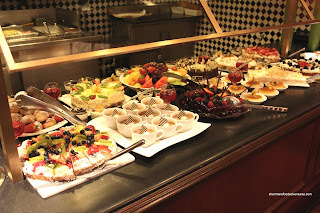 For a buffet setting, the desserts were both varied and consistent. Also included with the brunch was juice, coffee and tea. Service throughout our meal was attentive and unobtrusive. Much like our last visit to Griffin's for brunch, this time was no different. A solid experience at a reasonable price, considering the venue, location and quality of food. Are there even cheaper buffets that don't go into the deep end of Denny's/Uncle Willy's-type? There used to be some Asian buffets (not hot pot or sushi) that were like these with different stations, but I don't see many of them anymore. Any recommendations? EtodaC, unfortunately in the GVRD, we don't do buffets like they do in the States. I do not recommend any of the local buffets here other than the Asian ones. If you really must do a buffet, there is Cheers in North Vancouver that does a regular type AYCE line on weekends. There is Balkan House that does a Eastern European buffet on Sundays. Don't go to Grand Buffet... If you check some hotels/golf courses, you might find a buffet for dinner here and there also. But if you really want to do a buffet right, as Kim says, no one does it like the Americans... Old Country Buffet, Royal Fork. Or at the Tulalip Casino. 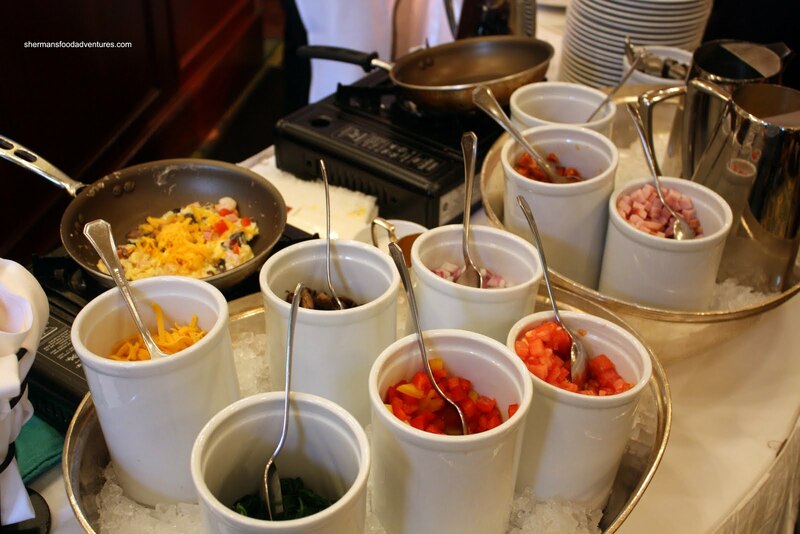 A good time to actually go for the Griffin's Buffer is for their Mother's Day special brunch. I think it's a bit more then, but I've been before and they have a lot of specialty items. They've also done the same for Valentines Day. I know those have already passed this year, but maybe they also have a decent Father's Day Brunch? No to Cheers Brunch buffet on Sundays! If you compare it to Hilton or Sutton Hotel buffet it would get a 1 star. I was there last Sunday and was quite disappointed in the food quality. Although it was $16.95 reasonable price I felt the food quality wasn't good. I would prefer to just order food items from their menu instead. They do offer great prices for their menu items though. Amazing thing also is it's crowded and packed!